When it comes to cold weather, I’m pretty much what most people would call a wuss. I sleep with the same thick blanket all year round, and it’s rare for me to not be at least a little bit cold all the time. You may know that I love layering, but the reality of it is that it’s probably just as much for necessity as it is for style. 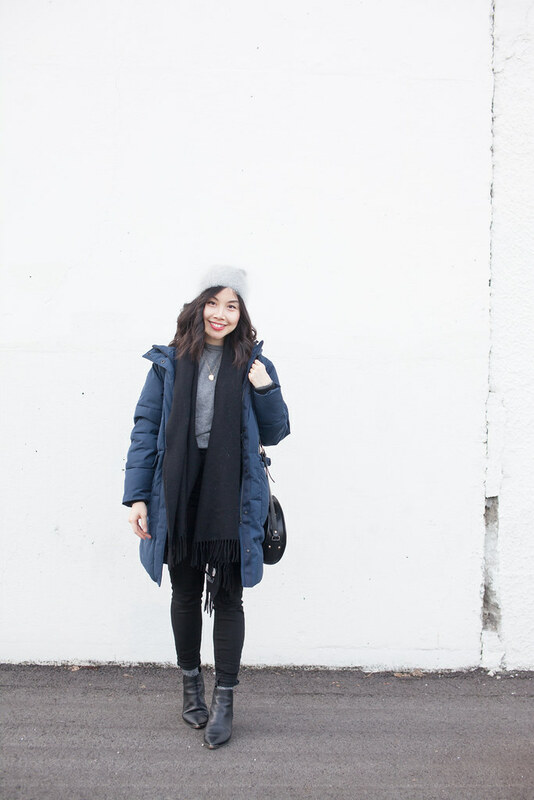 For that reason, outerwear has always been one of my biggest weaknesses when it comes to shopping: the promise of warmth and coziness in a garment sounds very attractive to me indeed. So when Everlane launched their ReNew line a couple of months ago, my interest was certainly piqued. The outerwear collection is actually made from renewed plastic bottles (read more here), and it’s the beginning of the brand’s commitment to eliminate new plastic from their supply chain by 2021. 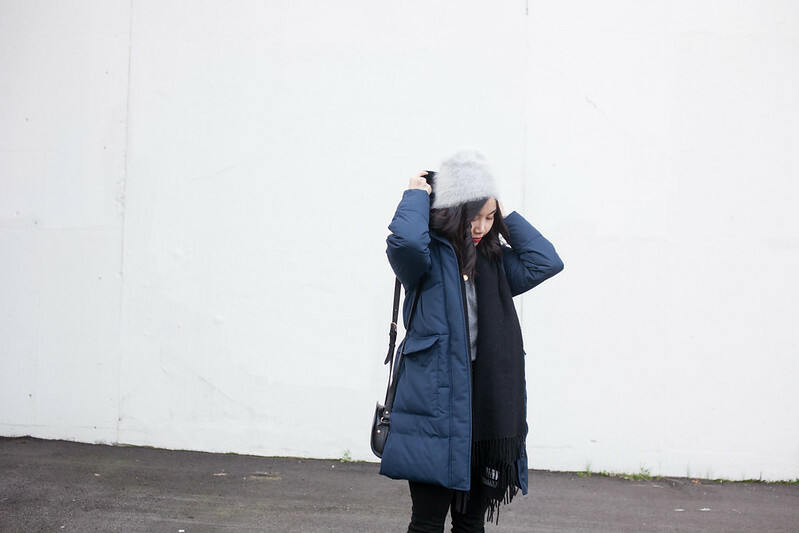 I’ve been putting their long puffer to the test since then, and I’m happy to finally be sharing my thoughts about it! Warmth | Because of my tendency to be cold, warmth is definitely the biggest factor for me when it comes to acquiring a coat. I’ve typically worn down-filled parkas in the past, but have been curious about alternatives for a while both due to ethical reasons and because down doesn’t do so well when wet. 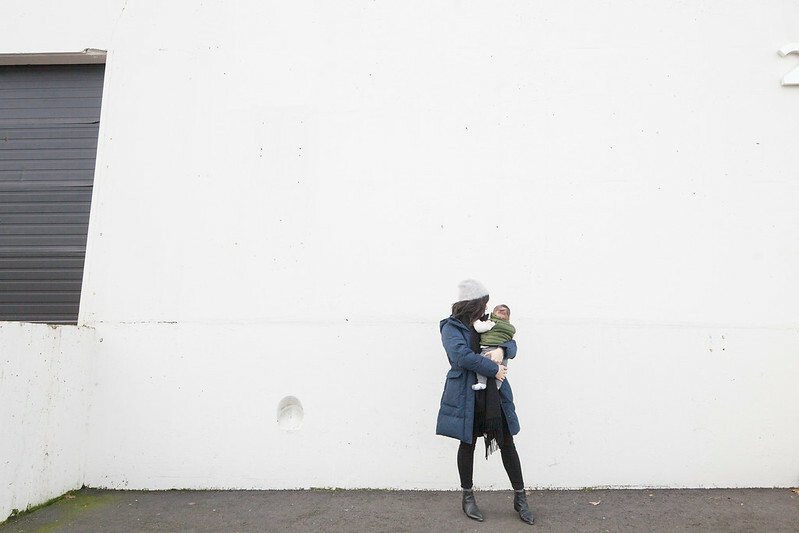 I’m happy to say that the ReNew Long Puffer passes the test in this category: while we’ve had a pretty mild winter here in Vancouver, I’ve gone outside several times with just a t-shirt underneath the jacket and have felt toasty warm. Coming from me, that means a lot! 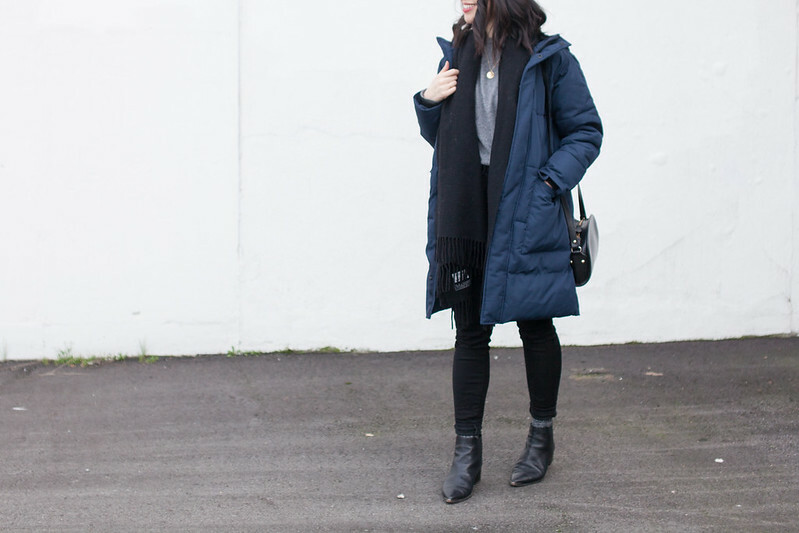 Colour | Navy has always been a colour I’m on the fence about. I like the idea of it – it’s a subtle, elegant shade – but for whatever reason I’ve never gotten that much wear out of the navy pieces in my closet. Maybe it’s because I feel like it’s neither here nor there: not dark enough to be black but not light enough to work as a pop of colour, either. I originally had my eye on the Long Puffer in Brick as I liked the boldness of it, but they were out of stock. Surplus was my next choice, but since I already have a few pieces of outerwear in that colour I didn’t think it’d be the best option… so with a bit of hesitation I went with the True Navy. When I saw it in person, I was pleasantly surprised: the colour is a bit lighter than I’d expected, so it acts more like a pop of colour than a close-to-black-but-not-quite shade (hopefully that makes sense!). Details | Everlane really thought about the details with this coat, and it shows. The generous and deep button-flap pockets are not only warm, but also perfect for when I’m going for a walk with Miles and don’t want to bring a bag; it fits my wallet, keys, and phone with lots of extra room to keep my hands from freezing. There are cuffs at bottom of the sleeves that lock in body heat and add softness. The waist drawstring adds feminine detail to an otherwise boxier garment. All in all, there are lots of thoughtful elements in the coat that help prevent it from looking like a run-of-the-mill puffer. Sizing | Since all of the models wearing the puffer on the product page are considerably taller than I am, I wondered if I would drown in this coat. But thanks to some of the details mentioned above (namely the waist drawstring), I think it actually works quite well on petites lengthwise. I got the coat in XS, and at 5’3 it hit just above the knee for me. It comes in XXS as well, which is 3/4 of an inch shorter. I’d say the coat is just slightly generously sized overall, but I don’t mind as I always like the option of being able to layer underneath. Based on my experience, I’d recommend this coat if you’re looking for a warm option for winter. That being said, there are a few things to take note of. I like my outerwear to be an easy way to pull a look together, but at the end of the day the ReNew puffer is a “practical” jacket even with the extra details. Maybe I’m not inherently cool enough, but I feel like I have to pair it well in order for it to look stylish; if I’m wearing my plain black leggings and APL sneakers I’m not sure it has that affect. That being said, I’m not really sure what I’d suggest to change this. Maybe some clothes just have to be primarily functional! Additionally, while the length and general fit are good, the arms of the coat are quite roomy. That makes the jacket very comfortable to move in, but I think it’d be a lot sleeker if there wasn’t quite so much room. The sleeves are also just the slightest bit too long; you can probably tell in the photos that there’s a bit of bunching around my elbows. Lastly, a few people have mentioned ‘leaking’ of the filling from the coat. I’ve worn my puffer about 15 times now over the course of two months, and unfortunately I’ve indeed seen a few pieces come out of the garment. Interestingly, the leakage has come through the fabric and not the seams so I don’t think it has to do with the coat breaking down with wear. It’s not bad enough to be of concern right now, but I’m not sure if it’ll continue to worsen. It’d obviously be a problem if it does, and I’ll definitely to come back here and update the post if that’s the case! 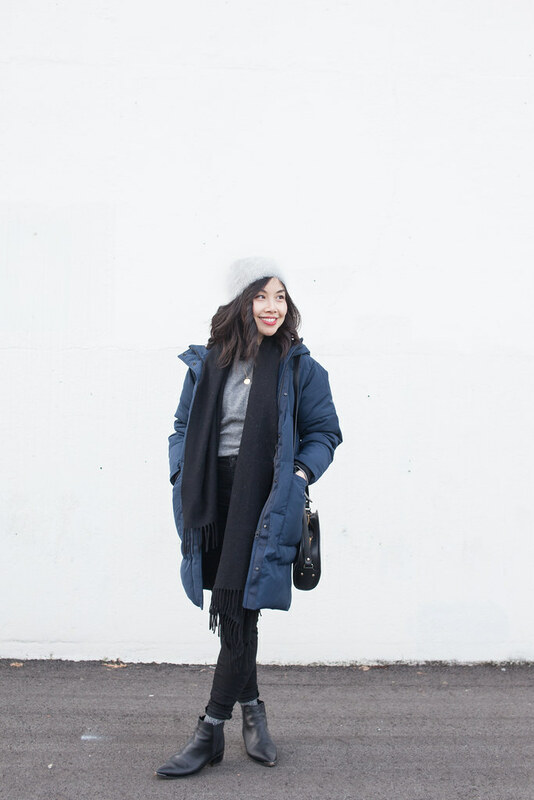 As a whole, I’m a fan of the long puffer and Everlane’s whole ReNew line. I think what they’re doing with the line is important and a good step toward being more thoughtful with our consumption and its implications toward the environment. 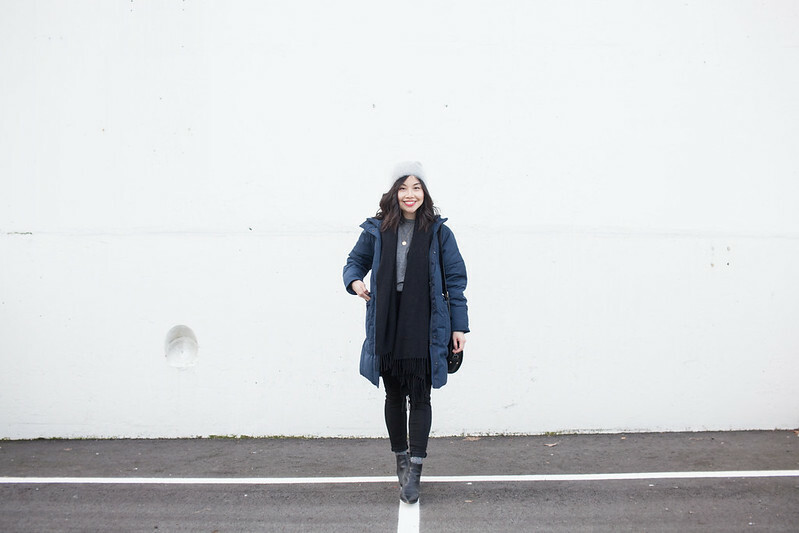 The coat is warm, practical, and is an elevated basic that I believe is good value for the price. I’m hopeful that it’ll hold up with wear over multiple winters! 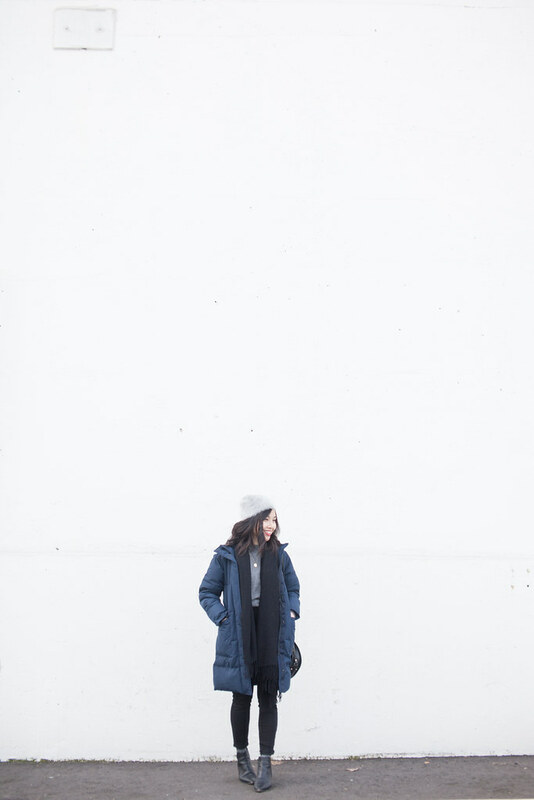 Disclosure: Everlane gifted me a long puffer for the feature, but I was not monetarily compensated for this post. I do receive a small commission if you shop through their site using my link (which I appreciate!). All thoughts are my own.